Rae's Washi dress has been done soooo many times, but with so many wonderful results. You just have to see the gallery on her website to see how popular this pattern is and now I know myself. I've had the pattern in my stash for some time now, I must admit that it was one of those impulse buys, tempted by the fabric used on the cover of the pattern. That Washi tape is just too cute. I don't normally opt for empire line anything, it doesn't really suit my body shape. 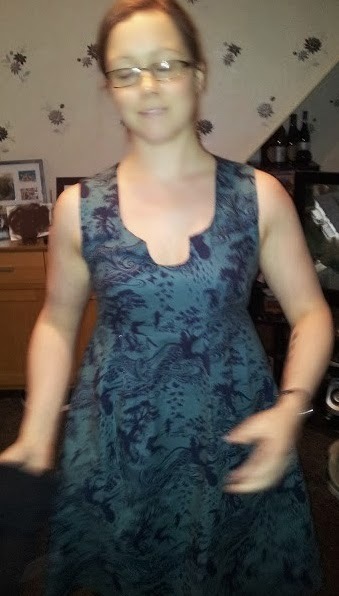 However, I really love this dress now that I have it. The fabric (Tula Pink - Prince Charming) was another impulse buy, it had been reduced to just under £2 a fat quarter and the pattern is truly wonderful. It's so wonderful I'd go as far as to say it would be wasted on a quilt as you'd miss the story! I did make a little, well actually quite massive mistake. I have a habit of putting markings that are on the edge of the fabric in by snipping a little mark on the edge. This patterns calls for many pieces to be cut on the fold and I managed to cut two little holes in the back centre of the dress :'( <--- very sad face. I've tried to fix it the best that I can, but when you look really close you can just see it. I still wore it to work on Monday!! The pattern and instructions make the dress so easy to make. I flew through it in only a few hours. The lack of zipper saved loads of time. I'd never tried shirring before, so some of the time was taking up with practice and experimentation with shirring. This turned out to be a lot easier that I first thought. 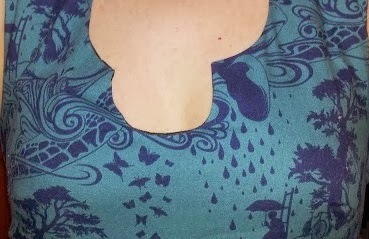 I love the little cutout on the neckline, it makes the dress look a little younger. However, somewhere in my attaching the lining I have done something that makes the left corner tug out a little, so on all of these photo's it looks as though the cutout is wonky. Maybe I didn't use enough interfacing? Anyway, despite my little mistakes I think it turned out really nice, even my fussy boyfriend said that I looked nice and instead of changing into my PJ's when I got home I should stay in the dress.